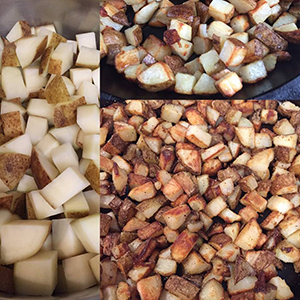 Hash Brown Potatoes are a real comfort food, great for breakfast or as a side dish. Cut potatoes into small bite size cubes, try to keep the sizes consistent for even cooking. Rinse the cut potatoes in cold water to remove excess starch. Pat dry the potatoes to remove water moisture. Preheat the grill to 375 degrees F.
Place iron skillet on the grill grates as the grill preheats (this is very important, you can damage your cold iron skillet if you place it on hot grill grates). Add canola oil to iron skillet. Add potatoes to iron skillet and stir potatoes. Stir potatoes every 10 minutes. Continue to cook potatoes for about 50 minutes or until crispy and golden brown. Remove potatoes from grill and season with Garlic powder, onion powder, black pepper and creole seasoning to taste. Stir to blend seasonings onto the potatoes. Serve immediately.